US, 1938, 93 minutes, Colour. Tommy Kelly, Jackie Moran, Anne Gillis, May Robson, Walter Brennan, Victor Jory, Donald Meek, Margaret Hamilton, Marcia Mae Jones. 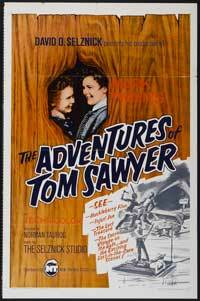 This version of The Adventures of Tom Sawyer remains the classic storytelling. It was an early colour film, coming only a few years after the introduction of Technicolor. It was directed by Norman Taurog who had won an Oscar in the early 1930s for Skippy. Taurog continued to direct a number of films including some of the Mickey Rooney and Judy Garland musicals. During the 1950s he directed a number of the Martin and Lewis comedies. During the 1960s he directed many of the Elvis Presley star vehicles. The film is an excellent introduction to the writings of Mark Twain and an introduction to the characters of Tom Sawyer and Huckleberry Finn as well as Becky Thatcher and Aunt Polly. Tommy Kelly and Jackie Moran are very good as the two youngsters. However, it is the older generation who make an impact, especially May Robson as Aunt Polly and Walter Brennan as Muff Potter. However, especially for younger audiences, Victory Jory’s Injun Joe is very frightening, especially when the boys are lost in the caves. Twain’s perception of the south in the 19th century, life along the river, family life, the background of interracial friendships, interracial fears are all to the fore. While the film is very much of its period, it remains something of a classic today. 1. The appeal of this classic, its story and characters, America in the nineteenth century? 2. Comment on the qualities of film? the Thirties, the use of colour, styles of acting. How well do they impress now? 3. The film's atmosphere of the town, the Mississippi River, Nineteenth Century ways of living, styles and manners? 4. The focus on Tom as an American boy, getting up to mischief, his strengths and his weaknesses? How engaging a lad? 5. The film's contrasting him with Sidney as a "goody goody"? Aunt Polly's favouritism to Sidney and her severity and unfairness with Tom? Tom's confronting her with this? Her real feelings? The portrayal of such jobs as the whitewashing, the school yard? How well did we understand Tom, Sidney, Aunt Polly? 6. Becky Thatcher and Tom's attraction to her? With the other girls in the town? His being punished on Becky's account, love and engagement and the kiss? The gift? The humorous comment on boy-girl relationships? 7. The drama of Tom running away from home, the justified reasons for it, the loneliness experienced even though he was enjoying himself with the other boys, the coming home, overhearing the truth, kissing Aunt Polly, crying at their own funeral service, revealing the truth and the humorous and ironic reaction of everyone? 8. The importance of the cemetery sequence, Huckleberry Finn and superstitions, boyish fear and beliefs? Their seeing the ghost, Joe's framing of Muff Potter? Their reaction? Their friendship with Muff and his appeal to them? The trial and the courage in telling the truth? Joe's throwing the knife? 9. The culmination of the story with the happiness of the picnic, the exploration of the cavern, Tom and Becky trying to cope alone, Becky's fears and Tom's courage, the menace of Injun Joe and his death? 10. Why has the story always remained interesting? Its structure, interest and appeal? The attractiveness of the characters? The exploration of childhood, growing up, American sentiment and values?